Garbage icons detailed vector set. 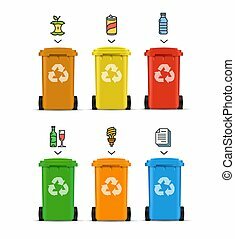 Garbage and waste icons detailed photo-realistic vector set. Animal, history and other icon in cartoon style.Mine, cleaning icons in set collection. Cleaning, History and or icon in black style. Travel, Art icons in set collection. education, nicotine, hunting and other icon in outline style.fashion, religion, beauty icons in set collection. medicine, circus, travel and other icon in outline style.beauty, fashion, celebration icons in set collection.